Noodle the Poodle is a self confessed worrier with super pushy parents and a career in the celebrity pet therapy ward, she has a lot of stress to manage. It this time of year Noodle likes to look extra glamourous for her patients, she spends hours backcombing her locks and adding glitter to her tail so she sprinkles when she tinkles. So if you see her tottering along take a moment to think of Noodle the Poodle offering a service to over indulging celebs who need pets to pat this festive time. 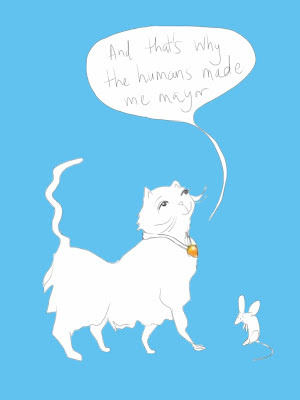 Moggie Mayor explains to a befriended mouse the importance of himself. His charm and grace make the mouse gaze at his feet not wanting to sniggering in the delusional creatures face. His memento ,discarded from a Christmas cracker, elegantly displayed on his puffed up chest shows he's had the best Christmas day ever. You have got to love the pets, if they are over attentive or elitist, we know our homes would be a little bit lonely without them. So today, Boxing Day, I give to my cat Piccolo.